The North Carolina House of Representatives is one of the two houses of the North Carolina General Assembly. The House is a 120-member body led by a Speaker of the House, who holds powers similar to those of the President pro-tem in the state senate. In the 2019-2020 session, the Republican Party holds a 65–55 majority over the Democratic Party, compared to a 75-45 Republican majority in the 2017-2018 session. The qualifications to be a member of the House are found in the state Constitution: "Each Representative, at the time of his election, shall be a qualified voter of the State, and shall have resided in the district for which he is chosen for one year immediately preceding his election." Elsewhere, the constitution specifies that qualified voters that are 21 are eligible for candidacy except if otherwise disqualified by the constitution, and that no elected officials may deny the existence of God, although the latter provision is no longer enforced. 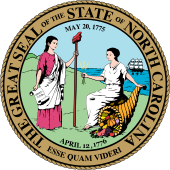 Prior to the Constitution of 1868, the lower house of the North Carolina Legislature was known as the North Carolina House of Commons. ↑: Member was first appointed to office. ^ Press, Associated. "Rep. John Bell elected North Carolina House majority leader". Retrieved March 16, 2018.